Sinfully delicious and blood-red, these Blood Orange Morgue-aritas are pumped full of bold fresh citrus flavor...and of course, tequila! This Halloween, stay as cool as a corpse under that costume by sipping on these Blood Orange Morgue-aritas! Sinfully delicious and blood-red, these Blood Orange Morgue-aritas are pumped full of flavor: bold citrus essence from the blood oranges, the right amount of tartness from the limes, a hint of sweetness from the simple syrup, and of course…tequila! I used one of my favorite new tequilas, Sangre de Vida El Corazón – not only does it come packaged in a very-appropriate, super-awesome anatomical heart decanter, but it is seriously tasty. When combined with the other ingredients, it makes for a cocktail after my own heart! 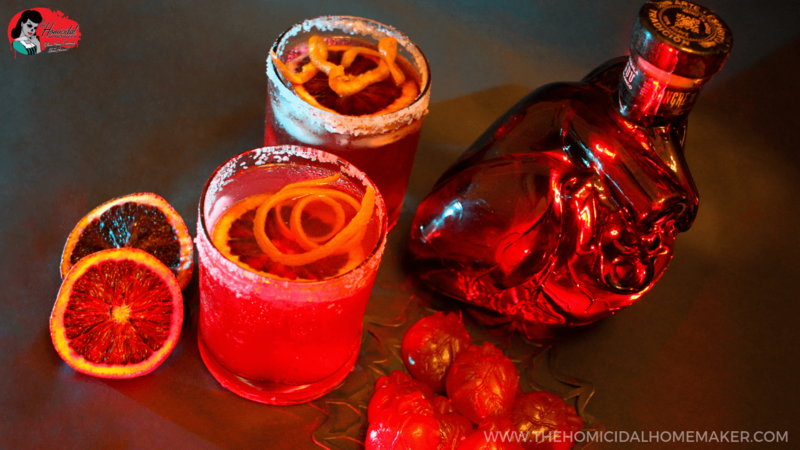 I’ve included three different ways to enjoy this Blood Orange Morgue-arita recipe at your Halloween party – by the pitcher, in single-drink form, and a fun jelly shot twist! These Blood Orange Morgue-arita Jelly Shots are not the JELL-O shots you enjoyed during your college days. Made with freshly-squeezed citrus juices, unflavored gelatin, and Sangre de Vida El Corazón tequila, these bite-sized jelly shots are bursting with natural flavor! And as an added bonus, since these are shaped using a candy mold, no paper or plastic cups are necessary for serving. Sangre de Vida Tequila is also an official sponsor of The Homicidal Homemaker®, so please be sure to go give them a follow on Facebook, Instagram, and Twitter! 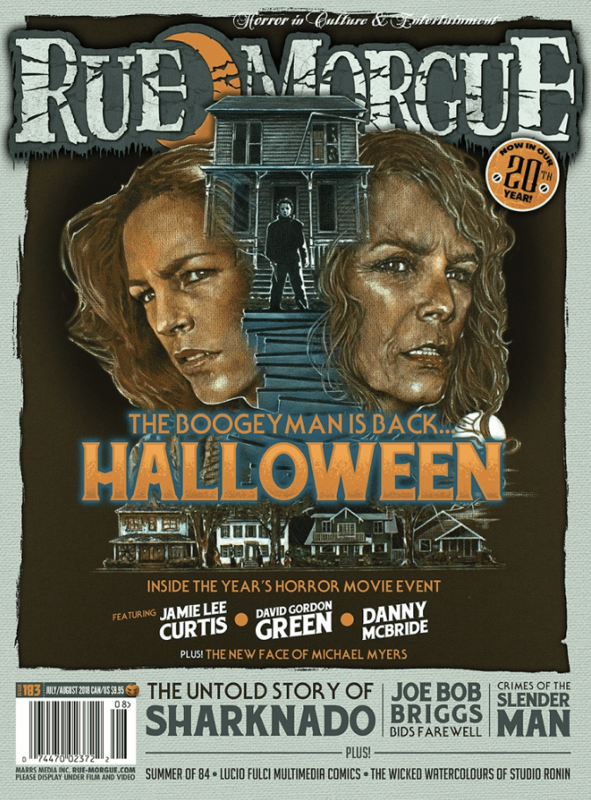 See this recipe in issue #183 (July/August 2018) of Rue Morgue Magazine! In a cocktail shaker filled with ice, combine tequila, citrus juices, orange liqueur and simple syrup. Strain over crushed ice into a cocktail glass with a salted rim, and garnish with fresh lime wedges or blood orange slices. In a large pitcher, mix together the the tequila, citrus juices, orange liqueur and simple syrup. Allow to chill in the refrigerator for at least one hour before serving. To serve, pour over crushed ice in a cocktail glass with a salted rim. *Simple syrup is made by combining equal parts water and sugar in a saucepan over medium heat. Bring the mixture to a boil, stirring constantly until the sugar has dissolved. Remove from heat and allow to cool to room temperature before using. Syrup will keep for about 4 weeks, refrigerated. In a saucepan, combine the citrus juices and simple syrup. Sprinkle the gelatin over top of the mixture and allow it to “bloom” for about two minutes; then turn the heat to low. Stir for about two minutes, until the gelatin has completely dissolved. Remove from heat and add in the tequila, orange liqueur, and a few dashes of blood orange bitters. Pour the mixture into your candy mold, and refrigerate for two hours, or until set. Did you make this Blood Orange Morgue-arita recipe? Be sure to snap a photo and hashtag it #homicidalhomemaker and #ruemorguemag for a chance to be featured! Next articlePerfect SCAREamel Apples with Nostalgia Electrics Caramel Apple Party!